The songs of Georges Brassens (1) with English translation: Il n'y a pas d'amour heureux Brassens sings Aragon's famous poem of the ambiguity of love. Il n'y a pas d'amour heureux Brassens sings Aragon's famous poem of the ambiguity of love. 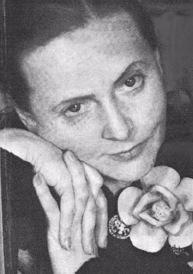 (Picture left) Elsa, the muse who inspired the poet, Louis Aragon.. The lyrics of Brassens' song are taken from a very famous poem by Louis Aragon (1897-1982). Its mood is melancholic and pessimistic. Aragon admits that it was affected by his difficulties during the harsh times at the end of the war, which prevented him living life to the full with his beloved wife, Elsa. He felt that if you created a high ideal of love, the realities of life would of necessity involve a betrayal. Brassens' recording of "Il n'y a pas d'amour heureux"
And when he thinks to grasp true joy, he crushes it. His life is a divorce, strange and full of sorrow. There’s no happiness in love. For our hearts to weep in unison in the night. I am conscious of having no deep knowledge of Aragon. I was a teacher of French language and literature but my acquaintanceship with Aragon was only a passing one. Without any insight, however, I find myself wanting to play the game of asking what precise human experiences are hidden under the abstractions of the poem. Perhaps an expert on Aragon will put me right afterwards. The first verse makes it quite clear, as Aragon himself explained, that he and Elsa were going through a bad patch. It had shaken their confidence as they had believed the love and understanding they used to share was forever. The second verse is a single continuous image and I am hesitant about interpreting it. Something that as a man he has been prepared for, he is no longer able to do and his life is all empty frustration. The third verse seems to be Aragon's acknowledgement of the great hurt he has caused Elsa, who is torn and wounded. The experience has convinced him that there is no such thing as happy love. His final plea is that they should get through these moments of torment side by side, blaming all the suffering on the human condition. However he reminds her that suffering is the inspiration of so much great art. 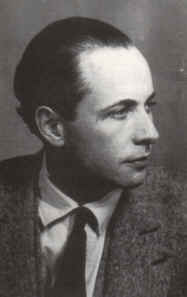 Thee photograph is of Louis Aragon. Below is a new version of the song made by Eva Dénia and Merxe Martinez, recorded in concert on the 6th June 2016. A similar poem in English literature on the theme of melancholic pessimism about love and life would perhaps be “Dover Beach”, which Matthew Arnold wrote in about 1851. In it the poet asks his new wife to stand with him to face the insecurities and disappointments of modern life, when love is inadequate, traditional moral values are collapsing and men fight each other in a darkness of ignorance, where they do not know whom they are fighting and why. I must admit that I am also adding this poem, because I admire the style of the reader and wish to keep this handy as a reminder to myself. He conveys the rhythm and the poetry but does not get in the way himself. Not an easy thing to achieve! Wow beautiful! I'm in french level one, just starting to learn this lovely language. But I'm always searching for french music, and that's when I came across your page. Thank you so much for the translation and explanation. Lovely poem! I was pleasantly surprised when watching Eight Women (Huit Femmes de François Ozon, 2002) on DVD this evening to see it end with Danielle Darrieux singing this beautiful song to the full cast. It's not giving away the ending of this mystery film to say that it's the perfect end to the movie. You can hear Nina Simone cover it on her final CD, A Single Woman, Barbara sang it too on Barbara Chante Brel et Brassens. Thanks for this Blog site as Brassens is difficult for anglophones. May you be spared by the demons of copyright complaints and protected by angels of Fair Use. I love your translations! Thank you I can now share some of brassens with my american friends! I tried to translate some songd myself a while ago but my vocabulary wasn't rich enough for that so thank you again! I'm not sure when this poem was written, but I think it might have something to do with Aragon's experiences during the War and his return to 'normalcy.' How can you return to normalcy after such a tragedy as WWII, and Aragon fought in WWI, and remember how promising the interwar period seemed. Jazz, flappers, freedom, rebuilding, Germany finally conquered, etc etc...one could have been forgiven for thinking finally some happy plateau had been reached, only have to have it destroyed in an instance. I think Aragon is juxtaposing that with how relationships can be so great and literally the next day it's over. Yet you find yourself eventually hoping and believing again, and if you do actually find a soul mate, the best outcome is you grow old and they die and then you're alone. So truely even the greastest love is not happy. And on a side note, the difference between the young lady and Brassens is a great example of the distinction between 'Parisian' French and French du Midi! I think Midi sounds much better. are you sure it's the people who died ? I have the feeling it's the words. It was very impressive blog, thanks for sharing it. explanation & translation of this poem is really amazing. it will great thing. By the time you've learned how to live, it's already too late. Another alternative translation. I respected the rhythm (but not the rimes) so you can actually sing it. Also, I chose "there's never been a happy love" (for length) instead of the correct "there is no happy love". It's certainly not "there are no happy endings" (?) and "there is no happiness in love" is quite a different statement. Hope you'll like it.